This Saturday’s Fight Night in Manila features four Chinese fighters competing in the prelims, a big step for the fledgling MMA market. It also marks an interesting full-circle return to China’s MMA origins: a decade ago four Chinese fighters fought in the Universal Reality Combat Championship in Manila (URCC) and won all of their fights. Those four Zhang Tiequan, Bao Ligao, He Peng, and Dai Shuanghai, are now ensconced in Chinese mixed martial arts lore as the founding members of the sport. The only name from those original four that will be familiar to some MMA fans is Zhang Tiequan, who fought in the UFC before retiring to coach the China Top Team gym, where two of the four fighters on the Manila card train (Li Jingliang and Yao Zhikui). It’s hard to say which quartet bears the greater burden. The original four had just a fraction of the training and experience, and headed into Manila in 2005 as heavy underdogs. The four fighters competing in 2015 have a couple big names in their camp - striking coach Vincent Soberano and Cung Le’s longtime trainer Scott Sheeley - a lot more MMA experience and gym time, and also head into their bouts as dogs. Back in 2005, nobody outside of gym rats and close buddies knew what was going on in Manila. But today the direction of the MMA industry in China hangs somewhat in the balance. Several fight promotions big and small have stepped into the market since China loosened the regulations for fight promoters. They are having success recruiting big names in the scene. Wang Sai, a tough brawler who I really wanted to see compete again in the UFC, just signed on with Kunlun Fights. Gifted striker Wang Guan, who fought for RUFF while it was still around, is also bouncing around the regional promotions. There are a bunch of younger fighters who would love to take the stage in the UFC, but find themselves with offers from big, local guys who will pay them and then it becomes a choice of taking the money or leaving the fight game. Because they haven’t done a good job of building up their connections in China, the UFC turns a blind eye to fighters out there who compete regionally. In the end its just business. Sure the China market is a big “what if” and there are hundreds of fighters training in new gyms across the country. But if the Chinese fighters can’t put on a show or win any fights this time around, the eye of the UFC will naturally wander elsewhere to markets with better fighters and bigger draws. The whole market in China will sag slightly, perhaps fragment, and the biggest beneficiaries will be the smaller promotions that step in and scoop up. That’s not necessarily a bad thing. If the time isn’t right, then the scene will just have to grow organically, like every other market out there. Kunlun and OneFC can do for Asia what the RFA does for North America—find and develop. I felt a definite congruence watching the RFA card in Sioux Falls last month and thinking back to fights I saw in Chongqing and Shanghai. The skill level is much higher in North America, but the basic elemental vibe is the same. Smaller stage heroics, aggressive almost volatile fights, a few proto-stars twinkling. Small town fan base howling for more. Men and women who taste glory on the small stage find it very hard to replicate that feeling in the big leagues. The Chinese have their chance to shock the crowd and beat some local favorites in Manila again on Saturday. The first four who did so ushered in the age of mixed martial arts in China: Bjj took off, men like Vince Soberano came and taught critical new striking skills, others like Andy Pi and friends rolled the dice on regional promotions for the first crop of fighters. The next four have the chance to jumpstart the scene in a similar way. These preliminary bouts might pass under the radar, but for Chinese MMA, a strong showing by the Chinese contingent will blow the current gym-building, coach-sourcing, young-dreaming-fighter wave in China sky high. So. Can it be done? Despite being dogs all around, the four Chinese fighters have an excellent shot at a sweep. These preliminary bouts present the oddsmakers with so little to go on, and I think a bit of bias might play a role here. Somebody has to be the dog right? Might as well be the utterly unknown Chinese fighter. My money, however, is on the China Quartet of 2015. 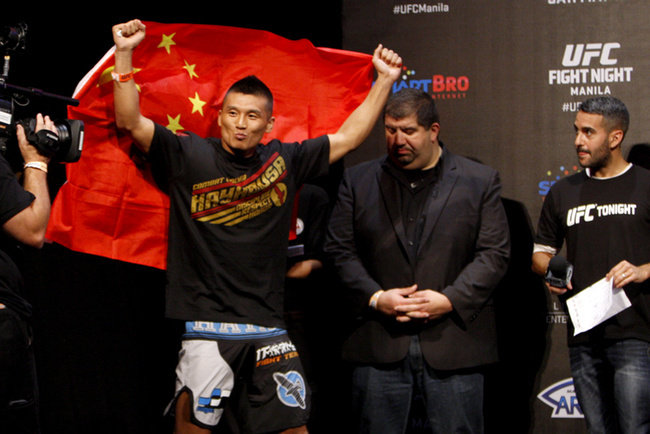 Yao Zhikui is the first Chinese fighter on the card. He beat Royston Wee in Macao in his first fight, but the judges thought otherwise, infamously resulting in Dana White pulling a “judge-switch” mid-event. His older brother is a renowned wrestler and Sanda champ in China and Zhikui is the younger brother who could take it further. It’s really a testament to the UFC’s matchmaking skills that he’s fighting Filipino-American Nicol Ticman. Both men are aggressive strikers with power. Ticman is fighting at home and Filipino fans are amazing; Zhikui probably has the better wrestling and that’s what beat Ticman in his UFC debut against Frankie Saenz. I can’t imagine this fight devolving into a clinch match. I predict a good start to the night. Ning Guangyou vs. Wee. I’m surprised at the odds on this one (Guangyou +110 right now). Guangyou has KO power and a solid chin so this could end pretty quickly if Wee fails to keep his distance. Even if it goes to the ground, I think Guangyou has the advantage there as well. If Wee stays away and remains technically solid with his strikes and kicks, then he has a chance. Li Jingliang looked great in his loss to Nordine Taleb. Had he not let the fight end with his back against the cage, he might have pulled out a split decision like he did against David Michaud. He is the most talented fighter coming out of China right now and he should be able to outwrestle and out-strike Dhiego Lima. Part of me thinks this is the UFC giving Leech his last chance to shine. Scott Sheeley has been in Zhang Lipeng’s corner since his last fight against Chris Wade. That one didn’t go well for the Inner Mongolian, but he had to have learned from the wrestle-hump he endured at the hands of Wade. If he can take Kajan Johnson down and beat him up, it will be a long, sweaty, exhausting night for the both of them, but Lipeng will get his hand raised.